Ambedkar Sambal Scheme (अम्बेडकर सम्बल योजना): Chief Minister Smt. Vasundhara Raje announced ‘Ambedkar Sambal Scheme‘ for the economic and social empowerment of the Dalit community on 14th April during the state level function organised at Ambedkar Peeth on the 125th Birth Anniversary of Baba Sahab Dr. Bhimrao Ambedkar. Under the scheme various programmes will be run to promote skill, livelihood and innovation among the Dalit youths. The following announcements were made on the occasion of 125th Birth Anniversary of Baba Sahab Dr. Bhimrao Ambedkar . Ambedkar Skill Training Centre: This centre will be set up in the premise of Ambedkar Peeth and shall be run by RSLDC where Dalit students will be given preference for skill training. Rs. 1 crore will be spent annually on this centre. Ambedkar Startup Scheme: In the first phase 100 startups will be included in the first phase under Ambedkar Startup Scheme. In this scheme dalit youth shall be promoted in entrepreneurship based on IT, new techniques and innovations. 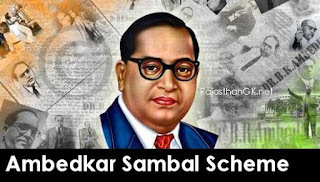 Ambedkar Fellowship Scheme: For extra-ordinary dalit students the Chief Minister announced fellowship for PHD and research work in Sociology, Public Administration, Law, Economics, Political Science and Phiolsophy subjects. In the first phase six students will get this fellowship annually. Ambedkar Electronic Information Library Network: For the students of Ambedkar Peeth a modern library will be set up where students will get facility of free books. Ambedkar International Scholarship Scheme: Every year five outstanding research scholars of scheduled castes to get financial assistance of up to Rs. 25 lakh for PHD in reputed foreign universities. Dr. B. R. Ambedkar Research Chair: For research on ideas of Baba Sahab Dr. B. R. Ambedkar Research Chair will be set up in Kota University. Ambedkar Peeth to Be Developed as Centre of Excellence: Chief Minister Smt. Raje announced to develop Ambedkar Peeth at Jaipur as Centre of Excellence. She also announced to appoint retired IPS Shri K.L. Berwal as a Director General of Ambedkar Peeth.